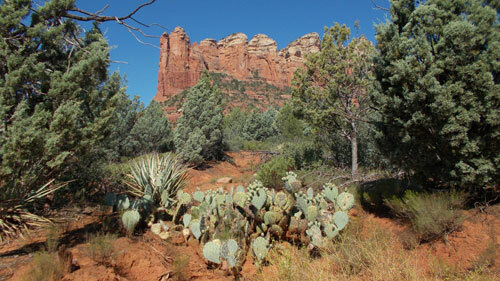 Blog / New Website, New Post & Sedona Red. Welcome to my first post on my brand new website. I felt like I wanted a site that was a bit more personalized and reflected more of me….the person that I am. One of my best friends is a very talented website designer and artist (as well as being an awesome friend) and she has built my new website for me. Thank you so much Spider Monkey Design. 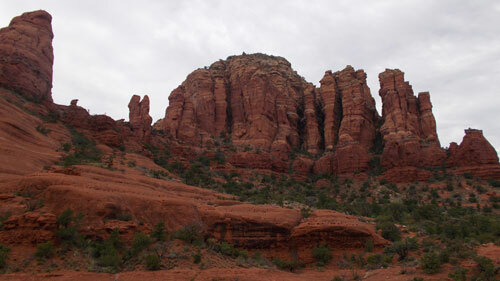 So…the last post I did I talked about inspiration and seeking out ideas from the landscape I was passing through. Well since that post I did an amazing bike trip through Canada and the USA (which you can read about here). 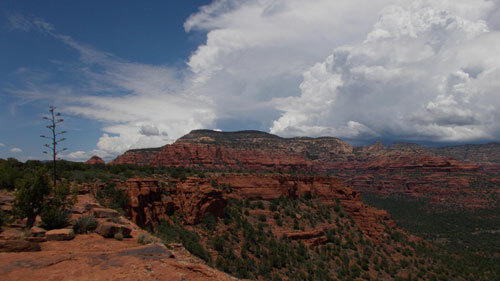 At the end of the ride I went on a jaunt with my American roadtripping best friend Alan, and ended up spending 6 days in Sedona, Arizona. 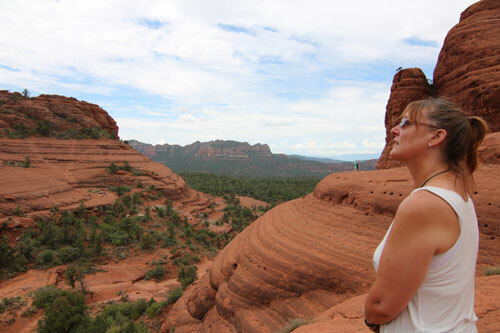 The colours of the rocks were so amazing and vibrant…so many different hues of reds and oranges, interspersed with clumps of shrubs and trees in all shades of green. 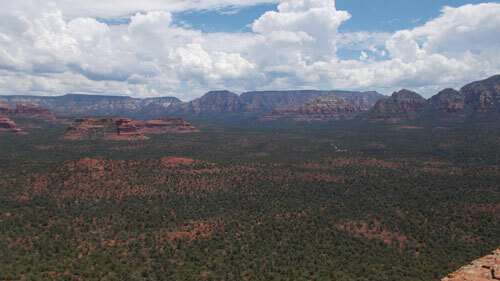 Seeing the landscape from higher up, the colours seem to meld, especially the greens. They become quite a grey green with a blue tinge. Now we go back to earlier this year. I try to create a piece each year for the Arrowtown Autumn Art Festival Exhibition. Its pretty much the only exhibition I do now, mainly because the venue is great, lighting and display are good and the Fine Arts category is fairly small and select. As I have said in an earlier post, quite often the name of piece comes to me and I design to that name. 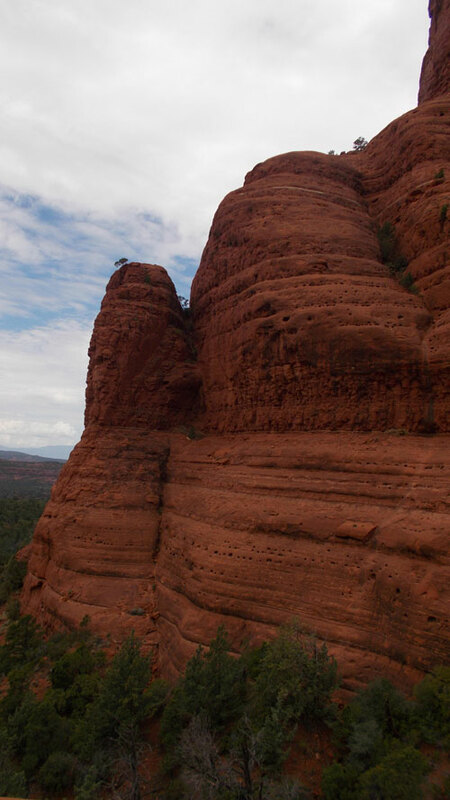 Well I kept thinking of calling a piece Sedona Red and started designing a wrap that would reflect the vibrancy of the rocks, with the pockets of grey green vegetation. 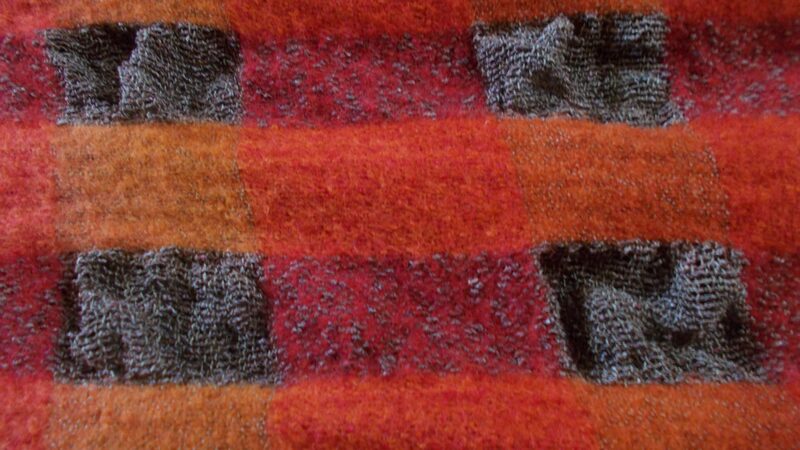 The idea came to me of weaving a wrap from fine 22 micron 74/2 merino wool, with stripes of a dull silk boucle, then felting then whole piece to make “pockets” in the silk stripes. So my first job was to wind the warps for the merino wool and the silk ready to dye. 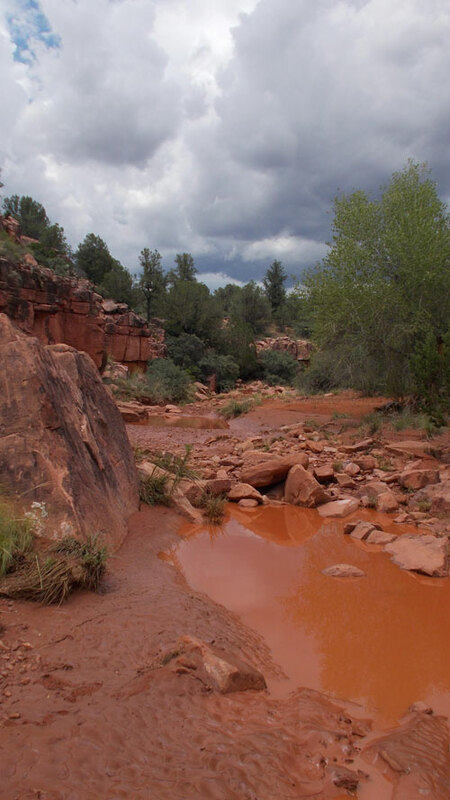 The photo below was the real inspiration for the rich reds and oranges of the merino wool. 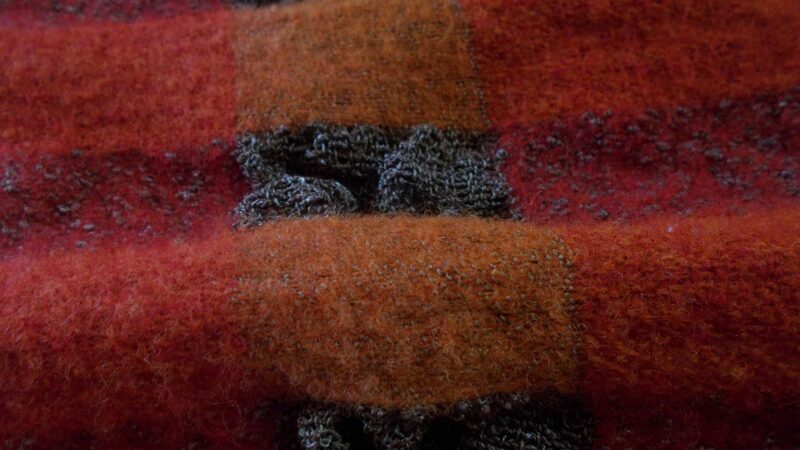 I dyed the merino wool in a gradient of burnt orange and fire red, with a little bit of red brown thrown into the dye mix. I knew to make the whole piece work, the colour of the silk had to be a greyish green and not too vibrant, otherwise the colours wouldn’t blend in the way that they do in nature. By using a dull silk boucle I kept the softness and drape I wanted but without the sheen that a normal silk would have. This photo was my guide to the green colour I was after. 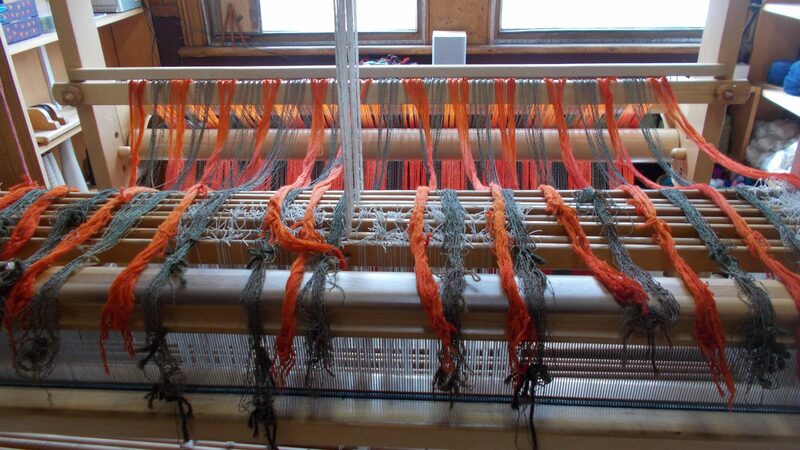 The weft for the wrap was the same merino wool as the warp and a plain silk thread. 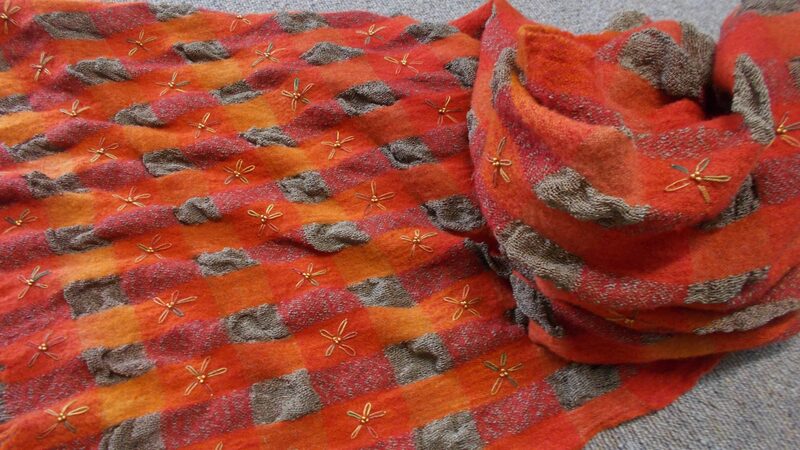 The merino wool was dyed a burnt orange and the silk the same grey green as the silk boucle warp. Now it was time to put both warps on the loom. 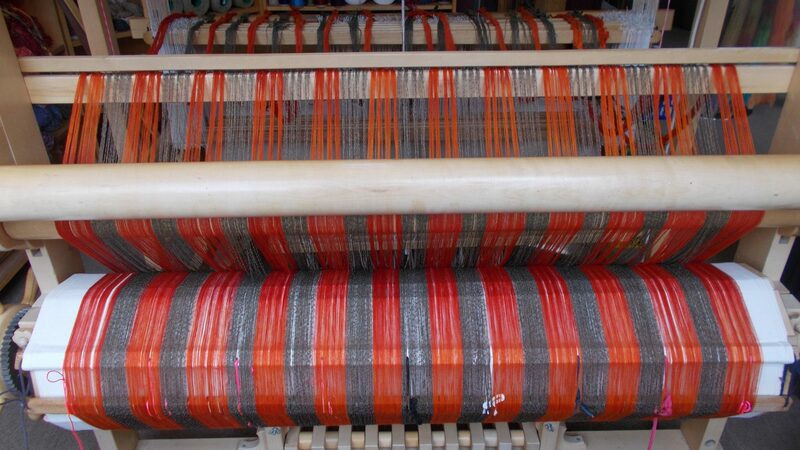 This might look quite confusing to some weavers putting two warps on at the same time, but it is really quite simple. The threads are in groups of 5cm and each one is tied as a separate warp. Takes longer to wind your warp this way but it is so easy to put on after dyeing. After threading up it was time to start weaving. 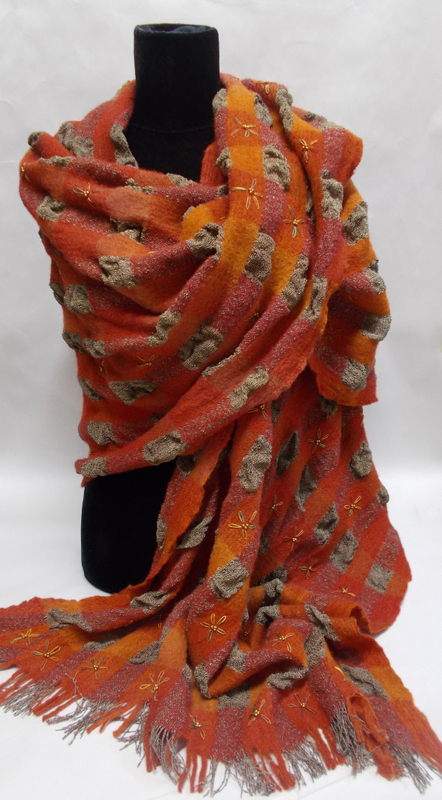 This is woven in alternating 5cm blocks of plain weave in the merino wool and silk. The nice thing about this sort of weaving is you don’t have to be too concerned with the weave being perfectly even and your edges being exactly straight as the whole piece is going to be felted. 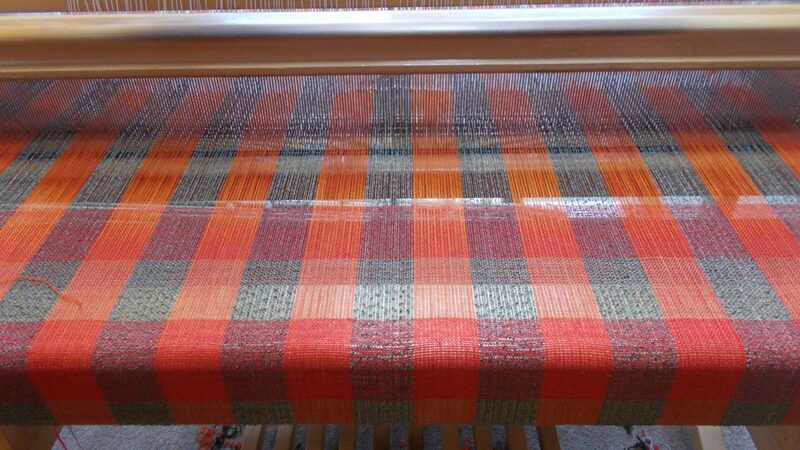 I wanted the weft to be a plain burnt orange so the subtle changes in the warp colour would show up. 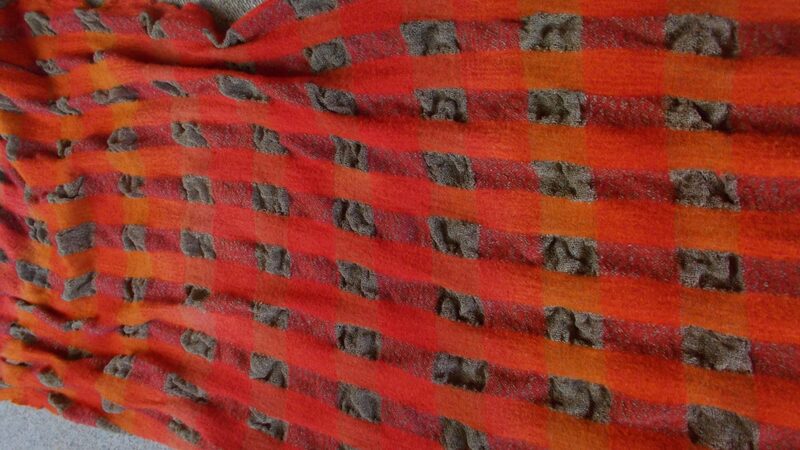 Once I had had finished weaving and taken it off the loom it was time to felt the wrap. 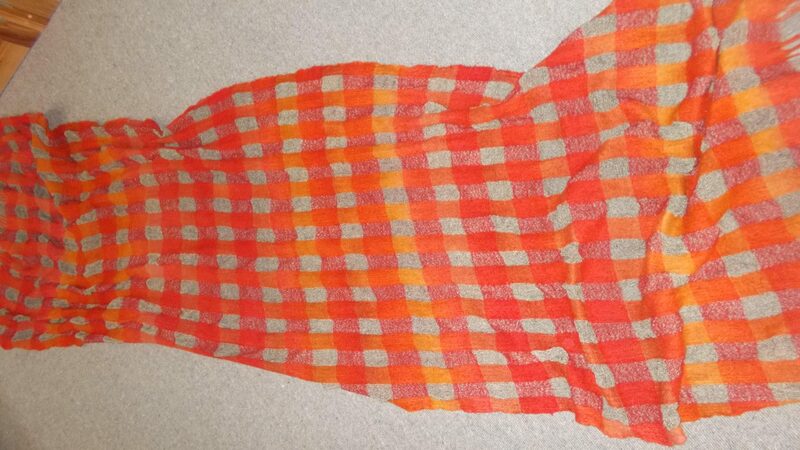 Here is what it looked like straight off the loom. You can see how subtle but effective the gradient of the burnt orange and red is. Felting weaving in the washing machine is really easy to do but you have to keep a close eye on it, and check the process all the time. This wrap took less than 10 mins to felt. I was really pleased with how it turned out. I knew the silk wouldn’t felt and would form little puffy squares in between the merino wool. Of course I had to embellish with something and since the only embroidery stitch I can really do is a lazy daisy, I decided to “rustically” embroider the ends with these in a random dyed silk thread and three little brass beads. Once I started I liked the effect so much I did them all over the wrap! 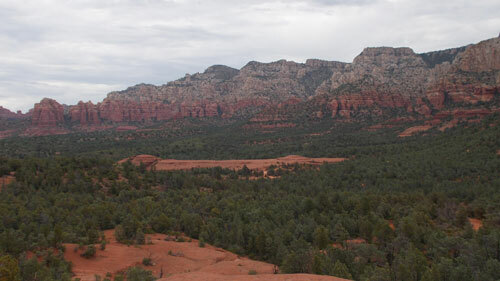 And this is the finished Sedona Red Wrap. For the technically minded…the sett for the 74/2 merino wool is 20 EPI, the silk sett is 12 EPI. Total warp length is 4 meters and total width is 1.25 metres. Finished length after felting was 2.14 metres and width was 72 cm. You lose nearly half your length and width in the felting process. I was very happy with the final result and really enjoyed making this piece. I think that if you are inspired by something or somewhere its exactly that! Its not a replication of what you have seen, but a very loose “take” of what has stayed in your memory and gives you a sense of recognition when you see the finished piece.